Thank you for the workmanship that went above and beyond expectations. Thanks for the excellent workmanship remodeling our guest bathroom. You are great to work with. Thank you so very much for your help recently when we discovered our new stove did not slide into its place. My only thought was to call Home Improvement and you answered the call. The young man Steve who came so quickly to assist us was a gem. Very accommodating contractor with creative ideas and a willingness to modify plans on the fly at the request of the homeowner. We were very pleased with the professionalism and quality of workmanship that we received. Highly recommended. Rob has been great. Very prompt in calling me back or emailing me any information. I would definitely recommend him. I had a design in mind and Rob Berke worked with me along with Steve who is extremely talented, thorough, and professional. We went through pictures, show rooms, and samples and finally came up with the right cabinets, right price and went over every detail. They took care to make sure my hardwood floors and carpet were protected. My concerns and any changes were met with professionalism and respect. They gave me a start and end date and they met them bothh. I highly recommend HIS. Thanks so much for a great job! I know it wasn't easy with such an old house. We have told our friends how wonderful and conscientious you are. We will definitely call you in the future as the need arises. We want to thank you for the excellent work you did at our home in remodeling our two bathrooms. From the start when you came to measure and estimate a price, to Penny helping me choose the right products, to Bub keeping track of things, until the end when Steve finished the top of the privacy wall, we have been pleased with your professionalism and workmanship. Steve was wonderful to work with and we appreciated his suggestions and expertise. His work ethic was the highest, and the care he took of our home while going about his work was impressive. If we can ever afford to remodel our kitchen, we certainly want him to do the work. Thanks again for a very good experience with your company. We will not hesitate to recommend you to our friends. 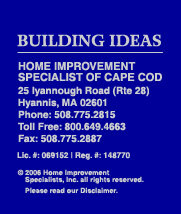 We were very satisfied with the work done by Home Improvement Specialists of Cape Cod. We are very proud of our bath/laundry remodel. We think it came out even better than we imagined. When the last town inspector came we mentioned how pleased we were. He said how nice it was to hear our praises instead of complaints. The workers were always polite and hard working. They certainly are an asset to the company. Before we sign off, we want to take this opportunity to thank you and all the crew at HIS for making our renovation as efficient and painless as these kinds of activities can be. Please thank Al for his patience in putting together a plan that suited our wishes and our budget. We can't say enough about the way Bub responded to our every question and the way he kept the project going smoothly and finishing ahead of schedule. That doesn't happen very often. Most of all, we want to thank the people who were with the job from day one they were all are real professionals and a pleasure to work with. Everyone who has seen the finished job has been very impressed and we have been quick to tell them about HIS. Several people have already contacted you about a project or have intentions to do so. While we certainly have no plans for additional renovations, we would certainly endorse HIS to anyone anticipating a project. Once again we are very happy with the service that we received from you for our replacement kitchen cabinets and countertops. Our phone calls were returned promptly and Al and Bub were available to answer any questions we might have had. Nathan showed up on time every day and did a fine job, along with Randy his helper. Thanks again and please use our name as a reference. My wife and I would simply like you to know that it was a great pleasure to have Al Muncherian quote the remodeling of our master bedroom bath. He is a very professional person and made a proposal that was responsive, thorough and completely answered all of our questions no matter how trivial. His proposal was far superior to any other we had received. Needless to say, we have authorized the remodeling and are looking forward to its completion. Additionally, we will not hesitate to use Home Improvement Specialists in the future. Let me begin by saying this letter is long overdue. My husband and I are absolutely thrilled with our three season sun porch, built by Home Improvement Specialists of Cape Cod, in August of this year. The professional and pleasant manner in which our requests were handled is to be much admired. Our calls were returned promptly, and everyone showed up on time - always with a friendly smile. It was a pleasure doing business with you all. In view of the wonderful mild fall weather we have been experiencing, we have been able to utilize this room right through December. Once again thanks to you all and please use our name as a reference. We want to take this opportunity to express our appreciation for the excellent Job you did on our all season, sunroom addition. We have already spent many hours of enjoyment there with friends and family. Each and every promise you made to us was honored. Keeping to your time-frames, your on the job clean ups during construction, the performance of the men working on the job plus the finished product make it very easy for us to highly recommend your company to our friends. Thank you again for a job well done. We are delighted with the results. I want to thank you and your team at Home Improvements Inc. for a project well done. I can not tell you how may horror stories that I have heard about contractors in today's tight market. You and your group performed exactly as you said you would and after a little rough time with the permitting effort did a bang up job. I'll pass on some comments from my neighbors. Next door neighbor (son-in-law is in the building trades)- “this crew is very professional, they help each other out and the crew boss compliments them when they do a good job”. Neighbor behind me (retired builder)-"this crew is really organized. They are truly professional as evidenced by the way they executed the project". Neighbor's contractor across the street-"the team doing your project are real pros. The quality of their work is excellent". Again, I want to thank you for a job well done. We have enclosed a small gift certificate in appreciation for the way you and your team performed. P.S. We love the way house feels now. It's like a totally different property. We have discussed our relationship with you and the others at Home Improvements Specialists during these past few months and we were prepared for the worst but received the very best. My wife deals with this type of activity weekly in her Real Estate business and what she has to go through is beyond my wildest imagination. I just could not tolerate it if I were her. So, as I said, we were prepared for anything to happen at any time, but you and your people very nicely screened us out of the problems so we have very little upset to deal with. We also appreciate very much the courteous and professional manner in which everyone treated us. We felt everyone was always very interested in our concerns and was trying to do something to take care of them. To summarize we are very pleased that we decided on Home Improvements to do the work for us and highly recommend you for future work. Just a quick note of thanks for the great work on our new kitchen and dining room addition. The work was done quickly and neatly and the quality of the workman­ship was excellent. Our friends and neighbors have been impressed with the results, and several of them have already phoned Home Improvements to discuss their own projects. Thanks again for all your help in planning and constructing our addition. Please include us on your list of satisfied customers. At this time I wish to convey to you how pleased we are with the renovations and also how much we appreciate all the effort and time that you spent to ensure that we would be satisfied with the finished product. Everyone who has seen our home has exclaimed over the renovations -- especially our sun room, and all have asked who did the work. We are not hesitant in the least to say that HOME IMPROVEMENT SPECIALISTS did it all! It was a pleasure having you work on our home and if we should ever require renovations in the future we will not hesitate to call upon you, the professionals, knowing full well that we again will be satisfied with the workmanship. Now that both the kitchen remodeling and the 16 x 26 foot bedroom addition are completed, I want to express not only my complete satisfaction, but in fact my absolute delight, with the results. Seldom in my life have I had the pleasure of having projects of this magnitude "go so right", and the purpose of this letter is to extend my thanks to all concerned. I'm known as a fairly fussy individual, and I've had enough training to be able to recognize first class construction. I consider both the kitchen and the addition to be first class in every respect. Any organization is only as good as its people, and the underlying strength of Home Improvement Specialists is the long list of very capable, very obliging, and very decent people in its employ. I can't say enough nice things about all of them. My wife and I were quite comfortable about leaving our home in their custody while we spent five weeks in Scotland. Needless to say, I'll be pleased to act as a reference at any time for your workmanship and your people. Again, many thanks for two jobs well done. I hope you will pass these thanks along to all involved. We have been enjoying and appreciating our new kitchen for three months now, and must tell you thanks for your company's attention, quality and reliability. We were very pleased with the work or your staff and their skills. The result is a kitchen so much brighter, with greatly increased storage, more convenient and comfortable, and yet within the same space. It exceeded our hopes. It is so good to have such a major project behind us! as you can imagine. Over the years since we first had you do our bath-laundry-bedroom project, we have recommended Home Improvement Specialists to many people. I just want to simply say thanks to you and the entire Home Improvement crew. I made the right choice in selecting Home Improvement Specialists for my dormer construction project. The new dormer looks fantastic and exceeded all of my expectations. It was a pleasure to personally work with you. Your honesty and sincerity was genuine, and more importantly, everything you promised was done. There were no hidden cost surprises, and when we did make changes, you were fair and equitable. It was refreshing to work with an organization who puts the customer first. I wish you the best of luck for continued success. Please feel free to use my name as a reference, or my house as a show piece of your work. I am so pleased with the way that the new kitchen counters and the sink look. When you are selecting from a small tile, you can never be sure what the final project will look like. The person who did the job was neat when he worked and everything looked great when I got home. I also saw the old rotted counter top and am glad that we made the change when we did. And yes the new screen door is a huge improvement. It is funny how you live with things for a long time and don't realize how ugly they are until you get something new. So thank you for a super job!!! !